Sometimes getting over someone isn’t as simple as just getting under someone else. Mindy loved Danny, but their love didn’t work. Now, Danny’s marrying his sweet nurse, and Mindy’s with bland Ben, the nurse with a heart of gold. That doesn’t mean that Mindy and Danny don’t still have feelings for each other, though, because love—and especially love that yielded a kid—doesn’t always work that way. 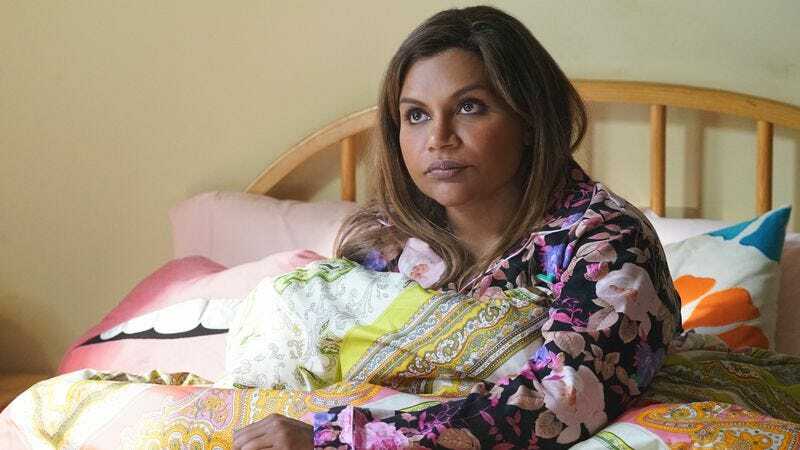 That’s the message of “Concord,” which finds all of Mindy’s New York pals prepping for Danny’s upcoming nuptials while Mindy, fueled by an Ambien- and Les Miz-boosted surprise journey to Concord, Massachusetts, tries to help her mom find herself. The journey starts when Mindy, drunk on wine and waiting on $100 worth of delivery BBQ, starts thinking old photos of Danny are talking to her. They’re not, of course, but that doesn’t keep her from hearing the disembodied voice of Chris Messina. (Apparently voiceovers are cheaper than guest appearances.) She freaks out, gets in her car—which, what? Mindy has a car in New York? And she didn’t use it to drive to New Jersey?—and enters a fugue state that somehow ends with her on her parents’ lawn in New England. After a quick Tom And Jerrying from her mom as she tries to enter the house unannounced at night, she settles in alongside her brother Rishi, who’s apparently been having a rough go of it at DJ school. Flash forward to the morning, when we find out that Mindy’s dad is off at a gem show in Nashua, and Mindy’s mom is supposedly having dinner with Mindy’s aunts. Only she’s not! Shock! She’s off with Conrad, some creepy theater producer that’s trying to get in her pants. She’s wise to his games (“Every scene is a seduction!”), but Mindy and Rishi don’t know that, and after some Mr. Robot-style email sleuthing, they track her down, accuse her of cheating on their dad, and thwart her plan to find stardom as a middle-aged Indian immigrant. Why, Sonu asks, doesn’t she ever get her chance to follow her dream? Smartly, Mindy encourages her to make her own chances happen, and Sonu sets off on the course of writing her own life-story to be performed, one would assume, by her. There’s a Mindy-centric sub-plot while all this is happening, naturally, and it’s a doozy. Morgan phones Mindy from the wedding rehearsal with news that drunk Danny has cornered him and confessed that he thinks he’s making a mistake. He’s still in love with Mindy, and if she shows up, he’ll leave the lovely nurse at the altar, indicating he’s both a wiener and a manipulator. This is appealing to Mindy, who, leaving her mom in the lurch, jets off back to New York, only to be interrupted by a call from Ben, who’s off with his daughter on some sort of school trip. He loves her, he says, and later, after a talk from her mom about how Mindy’s always been too hard on herself and a suggestion that maybe she was with Danny because he took on the role of Mindy criticizer, she’ll admit she loves him back. Danny, it seems, is forgotten. Mindy has moved on. At least until next week, when we’ll probably see him pop up in the show’s 100th episode, because it’s a special occasion, and that’s how TV shows and Baby-Sitters Club Super Specials work. Mindy is such a Claudia. What does it tell you about me that my favorite part of “Concord” was the special guest voice appearance from Ira Flatow, nerdy host of NPR’s Science Friday? Annette Castellano tells Ben, “I’ll learn your name if you stick.” Burn! That’s not my favorite burn of the ep, though. That’s Mindy’s “If you want to cheat with a mom, why don’t you go to the Chico’s at the Burlington Mall?,” which was directed at Conrad. Rishi’s “Why does [dad] have to buy his jeans at Kohl’s?” is a close second, though, because apparently I just really like jokes about specific clothing outlets.